Have you ever been interested in drawing? Have you ever thought about doing an art class but are too nervous or do not feel quite “good enough?” Well, the life drawing class at Studio Bee in Manchester’s Northern Quarter provides a warm welcome and a positive atmosphere, which allows everyone to feel comfortable drawing. Whether you are experienced or not, this life drawing class is a fantastic opportunity to practice your skills, meet people, and have a lovely glass of wine. You may be thinking “life drawing? Isn’t that when you draw a naked person?” You are correct. 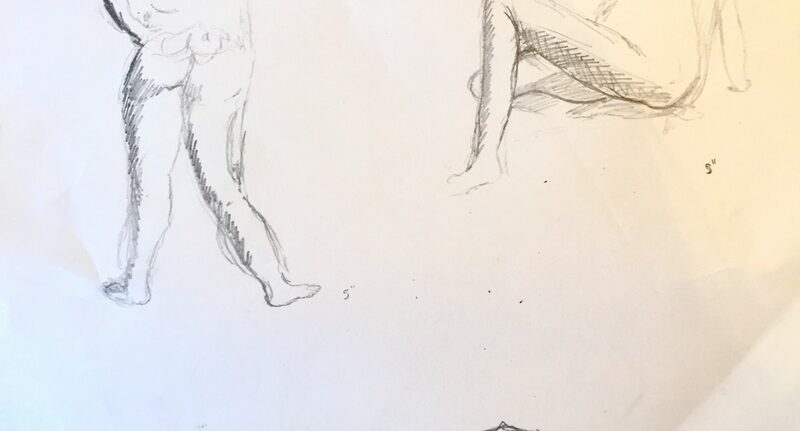 Life drawing is graphic and it is what you are most likely expecting and imagining in your head, but surprisingly it isn’t an awkward experience. The model was absolutely fantastic and well experienced. I will admit that I was a little shocked when I first saw the naked model – but of course, I wasn’t expecting anything else so I just cracked on with it! On arrival, I did have a few issues finding the class because it is down a dark alleyway (in a suitably bohemian fashion) and isn’t the most visible place. However, once I discovered the studio, the welcome was warm. What’s great about this class is that you are provided with all the artistic materials needed — ensuring that anyone can participate. Attendance at the bi-weekly classes is high, so it was a little bit crowded, but everyone had enough room to draw. We started drawing a few short poses to warm up, followed by five-minute poses and finally 15 minutes. After an hour of drawing, with music on in the background, there was a 20-minute break which included lots of wine and snacks that are all included in the price. The break provided the opportunity to relax, walk around the space, and admire each other’s work. After the break, the drawing continued until half 9, which was followed by even more wine and a cheese board — how civilised! If you wish to receive some feedback, you can have your work critiqued by the talented class leaders. However, the fun doesn’t end there — at the end of the night, there is the possibility to go and have a pint at the bar underneath the art class. Everyone gets 20% discount on drinks if they are part of the art class, providing more opportunities to socialise. Overall, whether you’re a budding artist or not quite the Picasso, I would recommend this class! Attendees are a mix of students, young adults and older people, all brought together by the opportunity to improve their drawing skills, have a glass of wine (or three! ), and enjoy themselves. For 10 pounds (or 8 pounds if you’re a student) I think this art class is really worth it!